Biotï¿½ne Oralbalance Saliva Replacement Gel provides long-lasting relief of dry mouth, helps maintain the oral environment and provides protection against dry mouth. Biotï¿½ne Oralbalance Saliva Replacement Gel soothes and protects oral tissues against minor irritations and burning sensations. Sorbitol, water, glycerin, xylitol, butylene glycol, sodium polyacrylate, polyacrylic acid, hydroxyethylcellulose, sorbi acid, glucose, benzoic acid, lactoperoxidase, lysozyme, lactoferrin, disodium phosphate, glucose oxidase, potassium thiocyanate. Lactoperoxidase and Glucose Oxidase. Together, these ingredients inhibit the growth of harmful bacteria. Lactoferrin. This deprives the harmful bacteria of iron, thus inhibiting their growth. Lysozyme. This splits the cell walls of harmful bacteria. 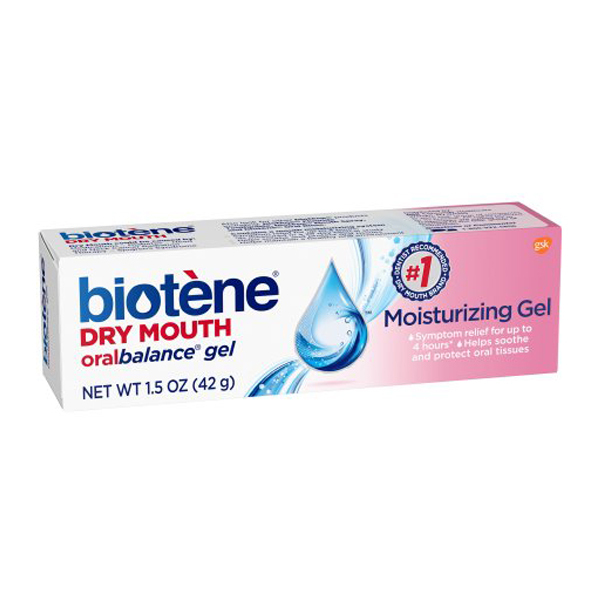 Biotene Gel contains natural xylitol for a more pleasant taste. Biotene is sugar-free.